Month by month, the Al Gore minimum extends its icy grip on the Solar magnetosphere, choking off our protection from high-energy cosmic rays. Sunspots remain quiet, and ominously so. We could increase energy production, to save lives, in case the Dalton Minimum, or the Maunder Minimum, is about to repeat. (When has history repeated? Climate is the paragon of historic repetition). Our scientists surely remember the Dalton Minimum. But too many scientists are funded by government, a government which paradoxically has no concern for history, or any science! True science is subject to falsification, but no matter how cold it gets, the pseudo-science of Al Gore and James Hansen is ordained, by the virtue of government insistence. Falsification is no hazard, for such lucrative pseudo-science. Facts be damned. “The atmospheric greenhouse effect lies at the heart of climate change science. Its very existence is now being challenged. I would have preferred to discuss my views with my professional colleagues in the climatological and environmental sciences. But they will have none of it. Energy production will be increased, but perhaps far too late to save the lives Al Gore has written off. Scientists are quiet, with notable exceptions, as described. Who bears the responsibility? When does it get warm, please? Feynman was trying to explain what’s wrong with various careless, agenda-driven, biased, preconceived mental frameworks that try to pretend that they are scientific but they don’t honestly eliminate falsified hypotheses according to the results of objective tests. The falsified hypotheses of Al Gore and James Hansen are indeed resilient. On the surface, it’s not a scientific world, Richard; nor in the short term. We must admit to living in a world sullied by eruptions of cargo cult science, precisely as described in the video below. In the end, real science will inevitably triumph. Al Gore and James Hansen will sooner, or later eschew their cargo cult science, just as the aborigines of Australia have done. Read “Cargo Cult Science” by Richard Feynman, thanks to The Reference Frame. Yes, it’s true! All real scientists are skeptics. Now is the time, more than ever before, with the oceans cooling, the atmosphere cooling, to question the polemic of Global Warming and human generated carbon dioxide. . . .Right now the so-called summer of ’08 is on pace to produce the fewest days ever recorded in which the temperature in Anchorage managed to reach 65 degrees. That unhappy record was set in 1970, when we only made it to the 65-degree mark, which many Alaskans consider a nice temperature, 16 days out of 365. This year, however — with the summer more than half over — there have been only seven 65-degree days so far. And that’s with just a month of potential “balmy” days remaining and the forecast looking gloomy. . .
Actual temperatures are insignificant, as is actual sea level, as is actual history. Actual is our enemy; we must only make-believe. Ignoring the actual is uniformly a serious mistake, and costly. 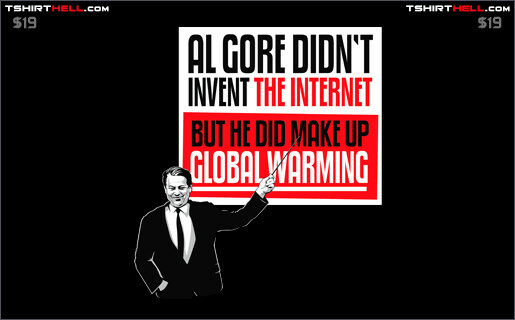 How long should we ignore the actual, Mr. Al Gore? Ignorance is surely your most famous invention. For the past half century, conversion of sunlight has been the future of electric power. In some die-hard circles (looney bins) conversion of sunlight will be the future of electric power, twenty years hence. For direct solar conversion, Arizona is nearly ideal, except for that nasty 34 degree offset (in North latitude) from the equator. (How unfortunate; we should all live at the equator). But solar conversion produces less than 1% of the electric power in Arizona, after 50 years of advanced scientific development. Another essential ingredient to the success of photovoltaics in Arizona even WITH GOVERNMENT SUBSIDY is the invention of an efficient battery; and they’ve tried it all, including pumping atmosphere into a hole into the ground (popular especially among government bureaucrats who get a cut). Then there is the intermittency . . .
A comment by someone who knows from professional experience — received via a reader. The report focuses on Tasmania, which is in roughly the equivalent latitude to Italy. So what is bad in Tasmania will be worse in Britain (for instance). As for Sweden or Canada, stop laughing! I am one of those people who supply and maintain solar and wind power installations to power electronic systems at remote (unpowered) sites — e.g. two way radios up on mountain tops. Twenty plus years ago, a couple of us had a good look at the possibility of making a dollar or two out of flogging this emerging technology to the great unwashed. We didn’t bother because it didn’t stack up energy wise or financially. I admit the efficiency of the solar panels us mere mortals can afford has improved a bit since then (at least 8%) but the figures are still similar. A loose look at the energy required to make the things verses the energy output of them during their average lifetime was not really surprising. The panel would return enough energy in the first year to smelt the aluminum in its frame and its mounting and transport the manufactured panel to us. We could not get energy figures for melting the silicon so the wafers could be grown and then cut up to make the semiconductors but overall it will be high so we guessed that it would take at least 100Kwh . This equates to 3 years output from the panel used up by the time it is delivered on site. But it doesn’t end there. Over the life of a set of panels the owner will probably need 3 or 4 sets of batteries. These are full of nice things like lead and acid and plastic and are very heavy. Then there is the magic box called the inverter. This is the box that converts the panel power up to the 230 volts mains power that we use. These are full of electronic things that take a lot of energy to make and have a reasonably short life span – say 10 years. You must include the energy costs for making and transporting these items to site in the overall energy that the solar panels must return during their lifetime. A battery pack of say 13kw h weighs in at approximately 500kg. So during the life of a set of panels you are going to have to transport 2 tons of them from (say) Sydney to Hobart and back again. Do the energy calculations on that one considering that the energy output per annum from each panel equates to about 4.5 litres of petrol. I must qualify the above by saying that in our lovely clean green (work in the tourism industry or starve) state we don’t get a lot of sun for large chunks of the year. When we are working out the energy budget for a solar site we allow an average of 3.5 hrs a day full output from the panels and have battery backup to allow for 14 – 28 days (site dependant) with no output. When the batteries are fully charged you can store no more so you effectively get no output from the panels. Therefore the extra output in summer is not usable unless you seriously upscale the battery capacity. Up in Queensland you can get away with less than half the number of panels for the same load. In drier climates panels seem to last a bit longer as well. There are some interesting practical considerations that must be considered when using these things. It never ceases to amaze me how many people seem surprised to discover that a solar panel needs to get actual direct sunlight on it to give a worthwhile output. This can be a simple task of (wait for it – shock horror – sit down Rev. Bob in case you have a nasty turn) cutting down the trees to the height of the panels because the sun gets pretty close to the horizon down here in winter. Or if you have built your house on the southern side of a hill or taller building it is even simpler – you need to move the house or increase the number of panels to compensate. An extra $10k – $40k will usually suffice. In Tasmania more than 50% of houses don’t have a clear enough view north to make solar panels worthwhile and if you elevate them you begin to shadow the house to the south of you. This means you can never optimize the energy return from the panels. And what about our nice green leafy suburbs? When your northern neighbour’s trees get high enough to shade your panels you lose output. Or if a leaf blows onto one of your panels the output goes down. (if you cover approximately 5% of the face of the panel the output will drop to almost zero.) The government will have to bring in draconian chain saw laws and you will have to have a photo license and a chainsaw safe to own one. Panels need to be cleaned regularly. Feathered airfoil excrement is especially effective in stopping them working. Every time you need to have the system serviced the serviceman will use petrol in his van to get there. This will probably average using the equivalent energy output of one panel for a year for each trip and that does not count the energy required to make the van in the first place. There is little doubt that in Tassie a solar installation as a collective item over its life is a net energy sink not a source. It is no different financially. My last electricity account for my workshop lists the cost as 18.5c per kwh or 21.4c including supply charge and for this my installation costs can be amortized over a 50 year life span. Over a 20 year life an $800 panel will return me 900kwh or $166.50 worth of electricity. Don’t forget that out of the massive savings you have made there you must buy batteries, inverter, have it installed, pay the interest on the money you borrowed to buy the system and maintain it. Note that this energy consumption would require 136 panels ($110,000.00), 14 day battery backup $13,500.00 (weight 1.6 tons, life 10 years), three phase inverter $15,000.00 (expected life 5 – 10 years). Interest alone would exceed $1,675.00 for the same period I paid the electricity authority $334.95. (Don’t forget that if the batteries went flat and I had no electricity to run the workshop I would still have to pay my employees so a system failure could wipe me out. I would have to have a generating plant and/or duplicate equipment to allow for that. Even if you quadrupled the energy output from the panels the figures don’t add up. Coming: Why not build a GIANT PHOTOVOLTAIC in the Sahara? The recent news (here) of James Hansen and his carbon jihadists fabricating “scientific” data from the Ripogenus Dam -Maine USHCN station, long after it closed, marks a new zenith of delusion at NASA. 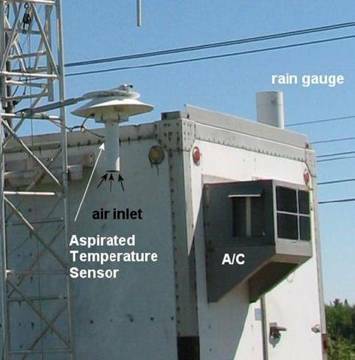 For eleven years after the station ceased all operations, “global warming” data from stations like the one below (touted as “the highest quality network of temperature stations in the world,” obviously a vast misrepresentation in itself) were generously massaged to create “junk” data which was then misrepresented as if it were ongoing measurements from Ripogenus Dam. Lie is compounded by lie from NASA GISS – to prove that Americans have too much energy. Drilling now could prevent deaths (which certainly would be be caused by cooling; not warming – starvation is already underway!) by the winter of 2009/10 – but instead we should SPEND $trillions in long range research programs to invent hypothetical alternative energy sources, and save lives starting not before 2020 supposing Earth’s climate will finally synch up with James Hansen’s delusion. Those research programs will obviously be “The highest quality research programs in the World.” Unreliable when it comes to saving the lives of the elderly, the hungry, children, or the freezing, though. End the arrogance, James Hansen; you are about to cause fatalities. Actually, you have already done so. You have invented a whole new class of “facts”, feeding a mindless stampede to oblivion with arrogant lies and false science. We don’t need renewable energy that causes starvation; what we do need is solutions for the next Little Ice Age; or the next real Ice Age. You have no valid data suggesting any change in the drivers of Earth’s climate; or if you do, we know for sure the data is massively cooked.